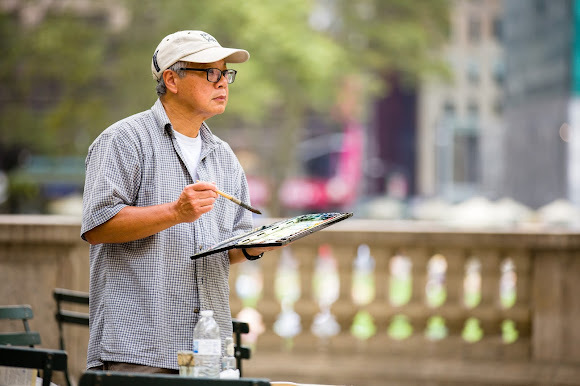 Bryant Park's Painter in Residence program has ended for the season, and we checked in with the final two painters to hear their stories of painting in the park. You can read our interview with David Lee below; stay tuned for Brad Marshall next week. Hungry for more painterly wisdom? Read our past interviews with John Catania and Susan Weintraub. 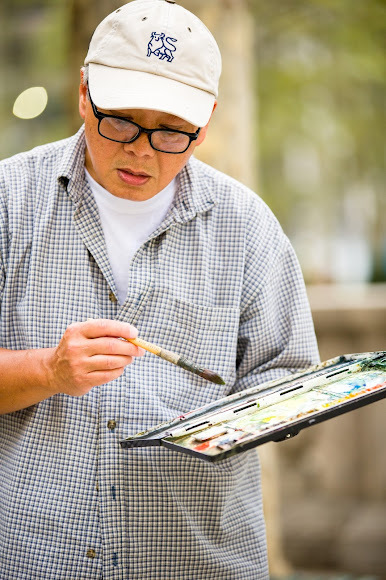 David Lee was our third Painter in Residence this season. 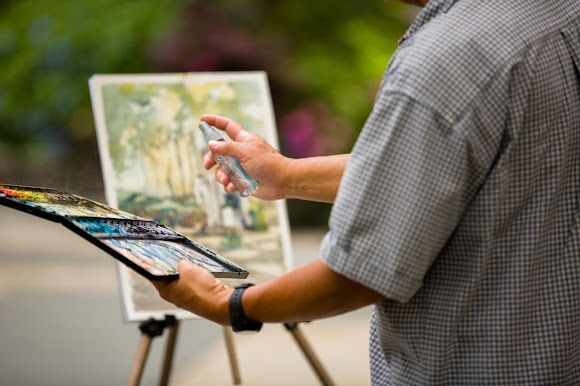 What was your favorite painting you were able to complete during your residency? I had quite a few. The one I painted outside the library, of the sculpture in front of the kids cart, and there were no people between me and the statue so I was able to take my time. I spent quite a bit of time drawing it, painting it, and I kind of wait for the right people to show up. When they did, I was able to paint those figures very quickly. Also I spent a lot of time doing the statue. It was exciting. I get a lot of time to do what I need to do, and then when the right things show up it was very intense to finish them in five or ten minutes. The figures were done very quickly, but the statue I spent a lot of time making sure the lighting and shadows on the statue were right. Also, the Bryant Park Hotel - there is so much contrast between the buildings behind it, which is-- the Bryant Park hotel is very dark, and the other buildings are on the lighter side. The Empire State Building is behind it. And what about the carousel one? That was very interesting as well. I drew the carousel, then painted the carousel, then waited for the kids to show up in the morning. When they showed up with their parents, I was able to add them to the scene. Lee puts the finishing touches on a depiction of the William Cullen Bryant statue. It's very different. 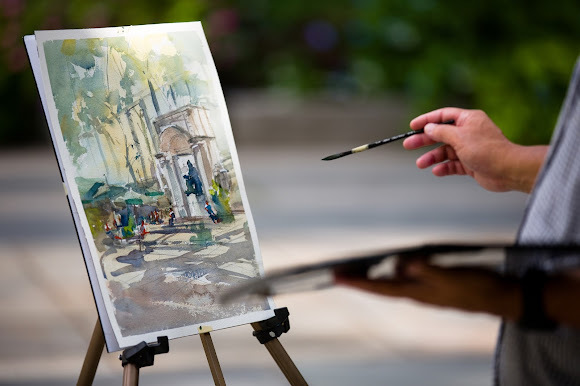 Painting in the park is what we call being 'on location.' Basically I paint whether it's sunny or a rainy day. I'm out there. Something you are always concerned about is shadows. Morning and afternoon shadows are very different. When we paint outside, we are at the mercy of the sun. On a cloudy day you have different lighting at different times. It's very different than a studio, because in the studio I have control. It's hard to concentrate in our bustling park, but Lee managed. What impressed me was that people were from every part of the world. I met people from Europe: Italy, Sweden! And people from South America: from Brazil, and other countries. Different cities. I also met some people from Florida, and Upstate New York. You just hope they don't stay too long. But I actually enjoyed those conversations. tall trees and buildings that surround the park's monuments. When I went to the park, basically I painted buildings, and I painted people. Coming from Pennsylvania, this is something that I always wanted to do, because it's so different from the suburban scenes I was used to painting on a daily basis. I do have good experience painting in New York; I'm familiar with it. It seems like, when I paint in the park, my composition changes quite a bit, I seem to paint more vertical paintings than horizontal, because of the high rise buildings. It gives me a very different perspective, and I really enjoyed the change. David Lee was born in China and raised in New York City. He attended the High School of Music and Art and took summer classes at the New York Art Students League. Since graduating from SUNY Binghamton 12 years ago, he has been a full time artist, garnering more than 30 awards, including first-place awards from Bethlehem Palette Club, Parkland Art League, and Lehigh Art Alliance. Working in watercolors and oils, his goal is to capture a moment in time that may invoke feeling and interest from viewers. He believes an artist should strive to show that what he sees is worthwhile and important.